Do not do what Israel did! When you hear God’s voice, soften your heart, lest you suffer the greatest of disasters. Soften your heart and experience the ultimate rest, the rest that God gives. The recipients of the Book of Hebrews were drifting away, going back to Judaism. However, the writer shows that we should not fall back into our old ways, because nothing surpasses Christianity. In chapter one the writer showed that Jesus is greater than the angels, and in chapter two that since Jesus is so great, His word exceeds that of angels. We have something far greater than what our fathers had in the wilderness. We have Jesus who built the house in which Moses served, and we are the house. The Hebrew writer quoted Psalm 95, which in turn takes our minds back to the Book of Numbers. 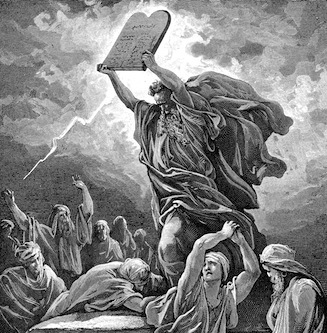 Moses recorded the continuous forty-year rebellion in Numbers chapters 10–25, sixteen chapters of a 36-chapter Book! Psalm 95 calls us to worship, explaining why we should bow down before the Lord, emphasizing that we are His people. Since we are His people, we hear His voice, and when we do, we must not harden our hearts like the generation that came out of Egypt, because they did not enter God’s rest in the Land of Canaan for rebelling against His voice. Just in case we miss the point of the quotation from Psalm 95, the writer now makes the application direct and personal for Christians. Let Christians hear Psalm 95 and the Book of Numbers, because we serve the same God who delivered Israel from Egypt and led them in the wilderness as they rebelled. Later the writer will say, “Jesus Christ is the same yesterday, today, and forever” (Heb 13.8). Since Jesus was with Israel in the wilderness and did not tolerate their persistent rebellion, the writer warned us against having an evil heart of unbelief, and thus depart from God as the Israelites did. Therefore, while it is still called, “Today,” let us encourage one another daily, because we only partake of Christ by remaining steadfast. God was angry with Israel for forty years in the wilderness; although He had delivered them from Egypt, but He would not let them enter His rest. The heart of rebellion, sin, and disobedience is unbelief. We rebel because we do not believe God’s way is best. We sin because we do not believe God’s glory is best. We disobey because we not believe God’s punishment will happen. Unbelief implies that God does not know what He is talking about. Unbelief implies that God is a liar. The promise of entering God’s rest remains. If they had entered Canaan, they would have had rest from the hard life of slavery. We likewise can enter God’s rest. If we enter heaven, we get to rest from the miseries of this life. God reaches toward us with the preaching of His word. He wants us to reach toward Him with faith, thereby mixing and mingling our faith and His word. Live by faith and you will not rebel, sin, or disobey, and you shall enter the rest reserved for Christians. This requires diligence, for we might fall as they did. God had Moses write the Book of Numbers that we might know of the dangers of falling away. Therefore, the Book of Numbers teaches Christians one of the most valuable lessons we need to hear. Verses 12 and 13 support the truth of verse 11. Verse 11 says we could fall through disobedience. Verses 12 and 13 reveal that God knows us as intimately as we could ever be known. He knows and sees whether we are diligent about entering His rest. He knows and sees whether we disobey Him. We have a Great Intercessor, Jesus our Great High Priest. God knows that we do things that could keep us from entering His rest. Therefore, He provides Jesus as a sympathetic priest, who knows the power of temptation, and so we can go to God’s throne and receive the mercy and grace we need during our time of need. Do you see that entering God’s rest has to be the top priority in life? What else matters, if you do not enter His rest? What are you doing that is so important you have not become a Christian? What are you doing that is so important you have put being 100% committed to Jesus Christ on hold? This entry was posted in Hebrews, NT Use of the OT and tagged Falling Away, Hebrews 3-4, Israel, Jesus, Jesus Christ. Bookmark the permalink.